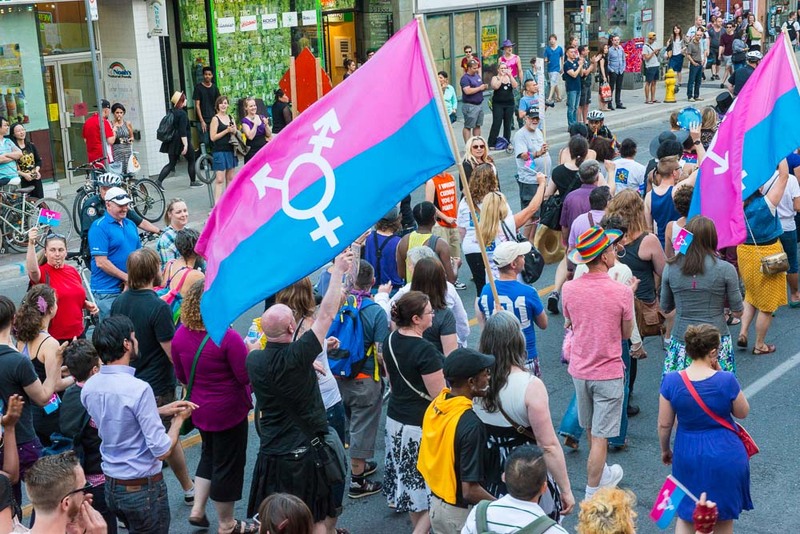 Two Toronto trans activists reflect on the importance of the Bill C-16. Although we live in a country that some would describe as one of the safest in the world for LGBTQ2S people, there is still much work to be done. While gay and trans bashing and bullying is illegal, homophobia, transphobia, and biphobia are still rampant in many institutional settings. Some of us can’t live a single day without being stared at, yelled at, or assaulted, and far too many young people are kicked out of their homes after coming out. This year on May 17, International Day Against Homophobia, Transphobia, and Biphobia (IDAHTB), the federal government announced legislation (Bill C-16) that will enshrine the legal and human rights protection of transgender and gender diverse people across Canada. This means that the Canadian Human Rights Act will explicitly protect people from discrimination and hate crime on the basis of gender identity and gender expression. This is historic because International Day Against Homophobia was originally created in 2003 to commemorate the removal of “homosexuality” as a mental disorder by the World Health Organization in 1990. Transphobia was included in 2009 “to give a specific dimension, and fight against the invisibility of the trans issue”. Yet, “transgender” remains internationally regarded as a disorder by medical and psychiatric officials. However, there is a growing body of literature which understands this diagnosis as a barrier to accessing legal status, health care, and social integration for leading full and healthy lives. Bill C-16 also incorporates amendments to federal hate crimes legislation, which sends a clear message to military, police, and justice institutions both nationally and internationally that it is wrong to treat transgender people differently based upon our identity and appearance. Once adopted, this bill will provide explicit protection of the lives of transgender people, and will send out a powerful and clear message that discrimination against trans people in federal institutions will no longer be tolerated. Trans people have a right to exist and lead healthy and happy lives. Although this legislation will not completely end the discrimination, hatred, and ignorance that far too many trans people have faced throughout our lives, it does offer hope for a safer and better future for the younger generation of trans people and comfort for the older generation as well. As children, many of us trans people received messages, which told us repeatedly that we were not normal, that we were different, and that we were not socially or legally included in society until we changed ourselves to fit into the system. Human rights protections subsequently will bring respect and dignity for us and introduce remedy when we experience “differential treatment” based on our difference. Transphobia leads to the high rates of homelessness, mental health difficulties, and suicide experienced by trans people. The TransPULSE study, a large Canadian research project that investigated the health needs of trans people across Ontario, found that 77 per cent of trans people in Ontario seriously considered suicide, and that 45 per cent had attempted suicide. Trans youth are at the greatest risk of suicide. The TransPULSE study also found that with strong family support, the risk of suicide decreases by 93 per cent. Supportive families and safe and supportive environments are critical to health and wellbeing of transgender individuals. As people who have fight so hard for our own lives, to be loved and protected, to be able to be ourselves in this world, we are filled with hope when our country recognizes that our rights as a trans people will soon be codified in law. This is an important victory and we are proud to live in a country that is an international leader on human rights. Yet, let us recognize that much still needs to be fixed in our society so that our youth, especially, can be their full authentic selves in all spaces. Every person, regardless of their gender identity or gender expression, should have the opportunity for full social inclusion and legal protection, and should be loved and protected by our fellow Canadians. No one should be afraid to live every day because of how they are treated based on gender identity or gender expression, and no person should become socially isolated after coming out as trans. Finally, Bill C-16 will send ripples of hope to a new and younger generation of Canadians and provide some comfort for those who have struggled much of their lives. Dr. Alex Abramovich is an independent scientist at the Institute for Mental Health Policy Research, Centre for Addiction and Mental Health. His program of research focuses on LGBTQ2S youth homelessness, mental health, housing, and strategies to prevent and end LGBTQ2S youth homelessness in Canada. Susan Gapka is a community and political organizer with a focus on trans, LGBTQ, housing, homelessness, and mental health issues.